Lindsey wanted to check out the Rebecca Beeson dress at Macy's so we braved the holiday crowds to try it on. If you haven't been to Macy's Herald Square since the decorations have gone up, you have to go. Nothing will put you a festive mood more, and holiday headrush is good stuff, it helps fuel the urge to buy. Can't stand holiday crowds? Shop before noon. And go to the dressing room next to the North Face coats on 2 (that's where the Beeson dress is, I had no choice), there always seems to be a room open there. First up, To the Max, left, $138. This is sweet, a sort of hip farmer's daughter look. But not really Lindsey. 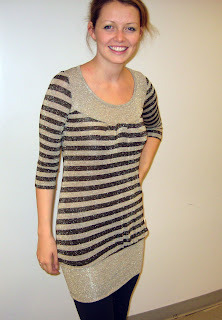 Nor is this Romeo & Juliet Couture dress just what Lindsey's looking for, although it's very cute ($98). It shines, too, but the stripes balance out the glow. Ah, my personal favorite. I forced Lindsey to try on this faux animal print Miss Sixty, left, $399. It's not her style at all, but I wanted to see it on her. Suddenly she's looking all movie star glam, perfect with her blond hair and tall good looks. But it's pricey so we're thinking about it. The belt and the gathered cap sleeves make this coat. And what did she buy? This shirt from Ben Sherman, left, $89. 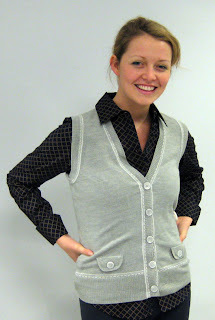 The vest was well-received (Ben Sherman, $89 also), but it too must wait for another day. Lindsey is looking for good work clothes and this shirt is a perfect call. Please click on the photo for its full, windowpane-patterned brilliance.